Transcript: Welcome to MyBinding.com. These are the A-Z Tab Contemporary Multicolor Dividers from Avery. Alphabetical organization made simple and stylish. These 26 dividers each bear a letter of the alphabet on their color coded tab and they all coordinate to a printable table of contents page. The tab is laminated to prevent ripping and the binding edge is secured with a clear reinforcing strip. Meticulously organize a big binder or even make your own dictionary, all possible with Avery. Welcome to MyBinding.com. 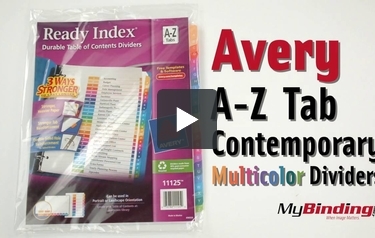 These are the A-Z Tab Contemporary Multicolor Dividers from Avery.